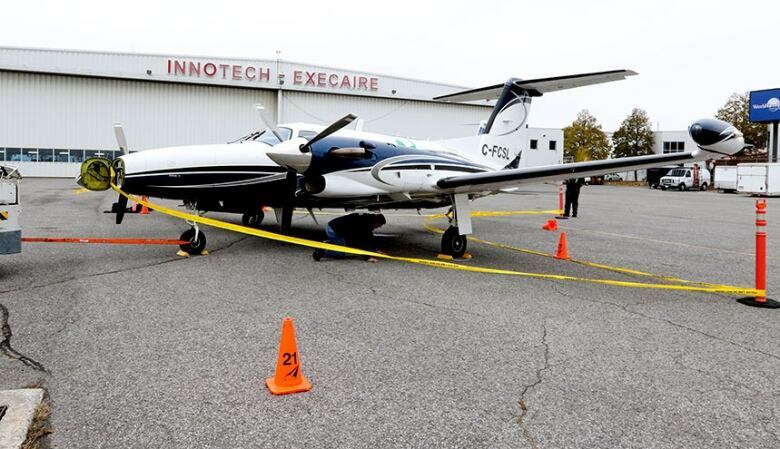 The Transportation Safety Board says there are a number of challenges in reviewing Sunday’s fatal collision between two small planes in Ottawa’s west end. A Cessna 150 and a twin-engine turboprop Piper PA-42 Cheyenne III collided shortly after 10 a.m. Sunday over the community of Carp. The Cessna 150 crashed in a wooded area near McGee Side Road, killing the pilot, who has not been identified. The Piper plane had two people on board and was getting ready to land at the Carp airport under visual flight rules, said Beverley Harvey, a senior investigator with the TSB. After the collision, it was redirected to the Ottawa Macdonald–Cartier International Airport, where it landed safely around 20 minutes later. In audio from the pilot’s call to air traffic controllers, he can be heard saying someone hit the bottom of his plane. Both planes suffered significant damage. One of the wings of the Cessna was partially severed in the collision and the pilot lost control of the plane, said Harvey. The plane caught fire after it crashed, adding to the complexity of analyzing the wreckage. While the Piper plane was able to land safely, the plane had damage to its aft fuselage, rudder, wings and main landing gear. Neither of the occupants of that plane were injured. Sunday was a sunny day, with very little cloud and visibility of around 32 kilometres, said Harvey, adding investigators will be looking at the sun’s angle and lighting conditions in case one of the planes blended in with the sky. One of the main challenges is neither plane was equipped with a flight data recorder or cockpit voice recorder and weren’t required to carry either. “Without voice recorders, we don’t know what was happening inside the cockpit. We don’t know anything. We don’t get that information,” said Harvey. She said investigators are analyzing both planes at the TSB Engineering Laboratory in Ottawa and will be relying on scratch marks and and impact damage, along with radar and audio data from NAV Canada for their analysis. “There’s one person that we would like to talk to, but unfortunately that person is deceased. So, without data recorders of any kind, it’s very difficult,” she said. The TSB will be interviewing family members, witnesses and air traffic controllers and will also be reviewing maintenance records of both planes, along with pilot training and qualifications. There is no air traffic controller at the Carp airport and investigators will be looking at whether that played a role in the collision. The TSB does not assign blame but will look at whether there are any immediate safety problems. Harvey said mid-air collisions are rare. There have been only 10 across Canada in the past decade, including Sunday’s.